MR. DORMAN: We also continue to have no additional information on the status of maintaining cooling through the other units at that site. 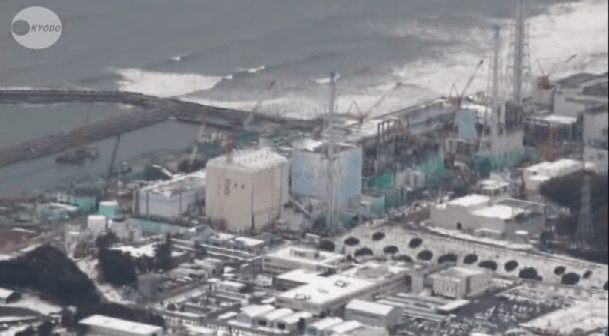 The media are reporting that in conjunction with that nuclear plant explosion, there were four workers injured, who have been transported to hospitals, but no information about the nature or extent of the injuries associated with that. CHAIRMAN JACZKO: Can you just summarize again for me, what your thoughts are on that? MR. DORMAN: Yes, our inference from the explosion that we’ve observed is that the explosion was in the reactor building and represents a significant failure of the containment, primary containment function. We did acknowledge that there are some folks, both within the Ops Center here and out in other agencies, who are looking at that, and seeing a hydrogen explosion the turbine building, but that’s not our primary assumption. 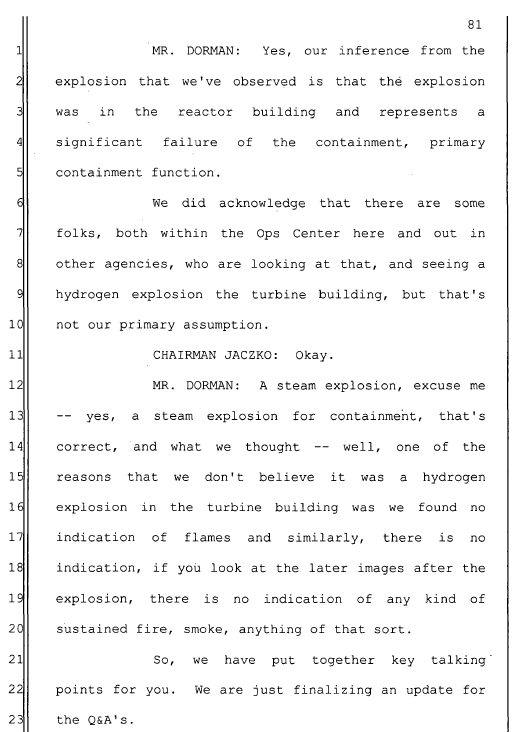 — yes, a steam explosion for containment, that’s correct, and what we thought — well, one of the reasons that we don’t believe it was a hydrogen explosion in the turbine building was we found no indication of flames and similarly, there is no indication, if you look at the later images after the explosion, there is no indication of any kind of sustained fire, smoke, anything of that sort. So, we have put together key talking points for you. We are just finalizing an update for the Q&A’s.